These programs, while billing themselves as “a search for the truth” almost always do just the opposite. Here is where the History Channel program, in my opinion, rolled first a seven then an eleven—The DNA. Riverside Chief of Police Sergio Diaz greenlit his Homicide detective Jim Simons to allow access to Cheri Jo Bates property for DNA retesting. (Last tested in 2000) The sealed Riverside Property was transported to the AISOCC DNA lab in San Diego. 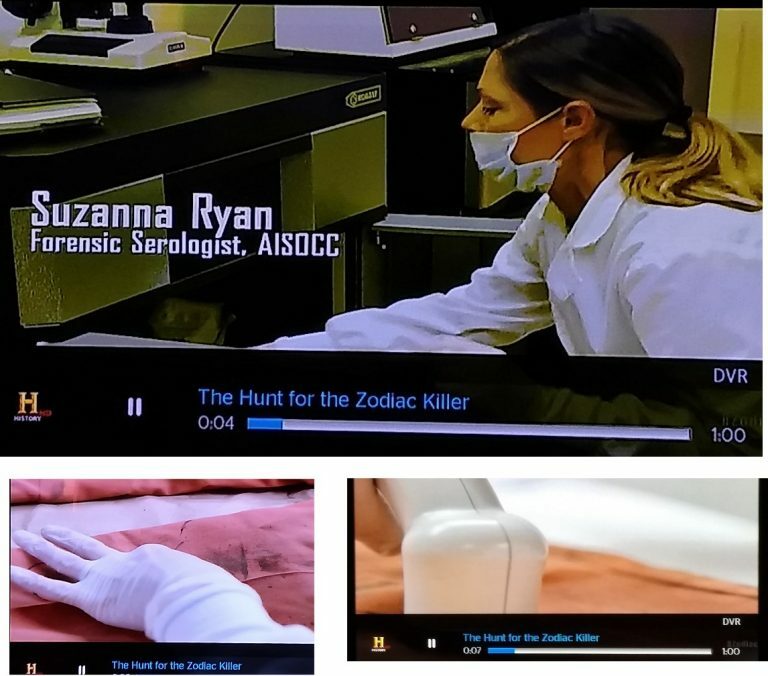 AISOCC Serologist Suzanna Ryan (seen in above photos) tested the pants worn by Cheri Jo Bates at the time of her murder for human blood. The result was “positive.” She then used an MVAC (micro vacuum) in an attempt to recover a new DNA sample. Although we haven’t heard of any reportable results, we are ecstatic that the M-Vac system did its job and collected DNA from evidence that was over 50 yrs old. That’s a pretty incredible feat! By mvacjb2014 in Uncategorized on August 8, 2018 .